The Under 14 Championship returned once again played to Maylands Golf Club. The course was in good condition considering the dry summer, the weather was not as hot as it has been but the sun shone and there was no sign of rain. The Under 14’s Championship is played as a gross score stroke play competition, and the Fred Stillwell trophy is presented for the best nett score. Thirty four players from around the county set out from 9.00a.m. onwards, and a few hours later Rory Bennet (Hainault Forest) returned to set a challenging Clubhouse target. His gross score , a one under par 70 was excellent and featured 4 birdies. William Horne’s (Thorndon Park) double bogey on his last hole was costly as he had made three birdies on that nine to get to one under after dropping two shots on his way out. Thomas Atkinson (Chigwell) & Bobby Rothery-Archer (Garon Park) were three shots back from William on 75s. Thomas took 3rdon countback after negotiating the back nine in one under par. Rory was delighted to be crowned champion especially as this was his last year as an under 14 competitor. In the Fred Stillwell Trophy competition, Patrick McLean-Tattan (Romford) managed a leader-board topping nett 65 as he continues his fantastic form this year which has seen his handicap plummet to a low teen figure from a mid-twenties handicap earlier in the year. Congratulations Patrick. The 2018 Under 14 Essex Champion golfer was Rory Bennet, with an excellent 70, and the winner of the Stillwell Trophy was Patrick McLean-Tattan with his score of nett 65. Our thanks go to Maylands Golf Club, Maylands Golf Club staff and their members for hosting the event and offering their course for the day. We would also like to thank Bob Powley, Captain of Maylands Golf Club. Congratulations to all those who took part and confirmed the future of Essex golf looks very promising indeed. 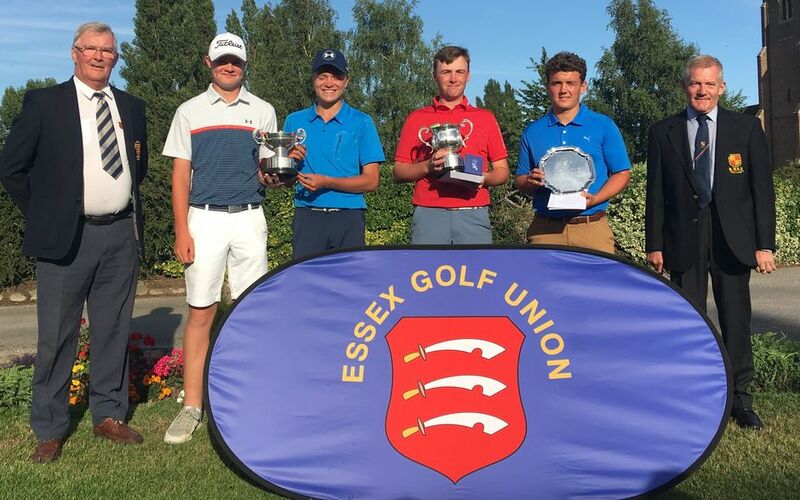 Gosfield Lake Golf Club saw the return of The Boys Foursomes Championship, 30 pairs took part from Clubs around the county to compete for the junior equivalent of the Essex foursomes Championship. A Scratch Strokeplay Championship which is played over 36 holes. The morning saw a bright start to the day with sunshine and a gentle breeze. As the day went on, the weather remained dry but the wind picked up which made the afternoon round slightly more challenging for the players. Gosfield had experienced a welcome drop of rain or two in the days leading up to the event which made the course play beautifully after a hot dry summer. The scoring conditions looked to be tough after the first few groups returned from their morning rounds, until Liam Evans & Luke King (Thorpe Hall) carded a 73 just one over par. Next best in was Conor Garvey & Jack Moutell (Playgolf Colchester) who managed a 74. Wilf Elliot & Jake Wells (Clacton) were two back on a gross 75 going into lunch. The afternoon winds caused some difficulties with the leading groups, Conor Garvey & Jack Moutell fell down the leader-board after only managing an 88 to follow up from their 74 in the morning which left them 8thoverall. Wilf Elliot & Jake Wells also struggled to capitalise on their morning performance finishing with a total of 158 after their afternoon round of 83 saw them slip to 5th. Liam Evans & Luke King also fell to 3rdposition after an afternoon round of 82, 9 shots off their morning total. Orsett’s Woody Eastman & Callum Newton improved on their morning score of 79 by 4 shots, returning a 75 to clinch 2ndspot overall with a total of 154. A fantastic effort which more than deserved the runner up position in this year’s competition. Garon Park’s in-form Josh Gray, Essex Boys’ Champion, was partnering William Dove, their morning round of 77 looked pretty average at lunch, but following it up with a 74 in the afternoon which included a number of lengthy putts holed by the pair saw them climb the leader-board to take first place by 3 shots from the Orsett pairing. We thank our fantastic hosts, Gosfield Lake Golf Club, their staff & members for once again hosting this event and providing their usual superb hospitality. The 2018 Boys Championship was held at Rochford Hundred Golf Club in glorious conditions with a gentle breeze blowing to help cool conditions throughout the day, with the Boys under 16 and under 18 Championships at stake. With a busy schedule around the country this particular week, we had a drop in entries compared to the past few years. A field of just 40 players were scheduled to play the excellently presented course. The morning round is always used as a qualifier for The Telegraph Vitality Junior Golf Championship hosted by PGA Catalunya. This year a 7 handicapper lead the way at the half way stage. Conor Garvey (Playgolf Colchester) had a fantastic start to the championship. Having had very little sleep after returning on a delayed flight from Ireland the night before, Conor managed to return a score which consisted of five birdies and just three birdies for a total of two under par for an opening 69. This means Conor qualifies for the National Leader board for The Telegraph Vitality Junior Golf Championship which we wish him all the very best of luck with qualifying for the finals. The next best score in was from Josh Gray (Garon Park) who managed a level par 71 which consisted of four birdies and four bogeys. Rory Bennet (Hainault Forest) also had a level par 71, thankful to the 5 birdies that he managed, despite a double bogey on his penultimate hole. Harvey Sullivan (Abridge) & Patrick Arundel (Boyce Hill) both returned at lunch time having secured a solid start to their events with a pair of 72’s securing 4th position going into the afternoon round. One of the favourites for the competition was Chelmsford’s Michael Gilbert, his opening 77 made it difficult to fight back as he was 8 shots off the lead at lunch but his level par 71 in the afternoon secured second position in the event overall so a great effort after a disappointing morning round finishing on 148 (+6). Unfortunately, the lack of sleep must have played a part in Conor Garvey’s afternoon round, his 82 saw him slip to 9th position overall. Harvey Sullivan followed up his 72 in the morning with a 77, which he was disappointed with yet still sufficient for tied 3rd on 149 (+7). The two others that finished on 149 with Harvey, were Callum Newton (Orsett) & Jake Wells (Clacton). 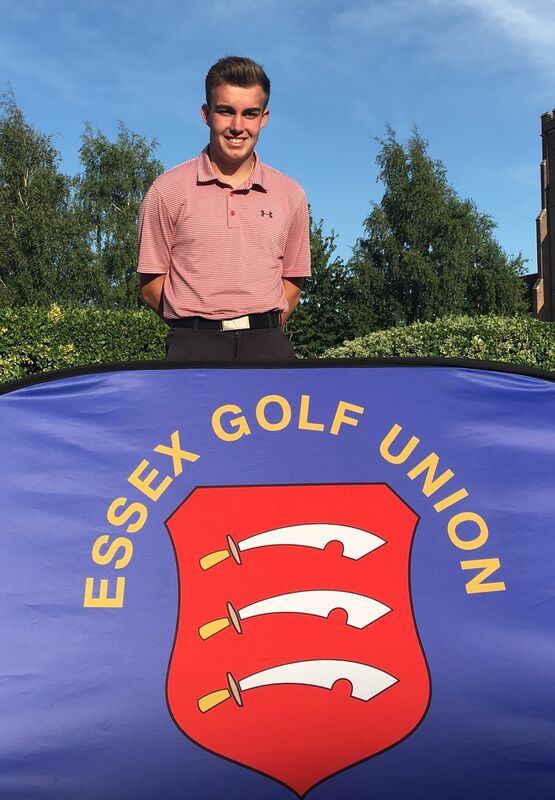 Josh Gray managed to limit the amount of dropped shots on the day to 3, finishing with a 74 in the afternoon to win the Essex Boys Championship by 3 shots from Michael Gilbert. Congratulations Josh on your victory, becoming Essex Boys Champion 2018. The Under 16 Championship which is also run on the same day saw Jake Wells’ impressive total of 149 pick up the trophy. Congratulations to Jake. Congratulations to Harvey Sullivan & Lewis Wright who won the Essex Boys Team Prize on behalf of Abridge Golf Club, finishing with a total of 299 (+15). A special thank you to Rochford Hundred Golf Club and their members for their hospitality, also to Rochford Hundred Golf Club Past Captain Marshall Dale for being present, not only starting but also for presenting the prizes to the juniors along with Roger Walmsley, Essex Golf Union’s President. A beautifully sunny day at Braxted Park saw a field of 25 under twelve year olds battling it out to become Essex’s Under 12 Champion. There was no lack of quality in the field with most players scoring below their handicaps despite extremely hot conditions. Alexander Oddy finishing 6th with an 81 playing of a handicap of 20 was just one of those examples. Another notable score was from Oliver Baker (Colchester) shooting 80 off his 17 handicap to finish 5th overall after countback. Charlie Croker (Epping) returned a score of 80 to secure 4th on countback. 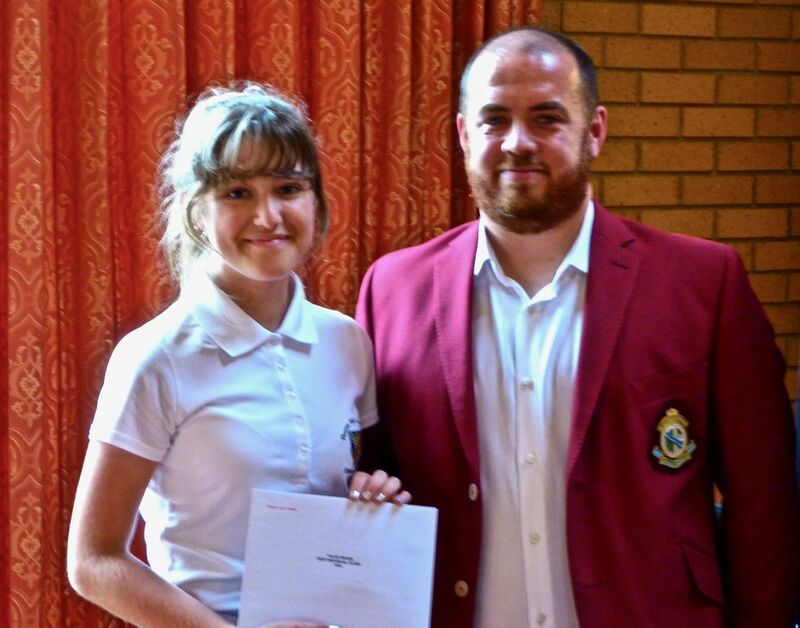 Pierce Mosely (Epping) was the lowest handicapper in the field and his 78 was enough to secure 3rd place losing to Bailee Taylor (Colne Valley) on countback. Bailee managed a phenomenal score of 78 and playing of a handicap of 23 will see his handicap reduce dramatically following such a great result. Dylan Hussey (Romford) was one of the early starters but his impressive 75 off of an 11 handicap, meant he was in for a long wait. That wait I’m sure he will agree was well worth it, being crowned U12 Champion of Essex for 2018. The scoring overall was impressive and all the players should be applauded for their efforts and their behaviour on and off the course. We thank Braxted Park Golf Club and all of their staff and members for their outstanding hospitality. The manner in which they presented their course was magnificent and we are sure that many that visited will return in the near future due to the feedback we received from players and their parents. The 2018 South East Junior Championship event was weather affected this year, with torrential rain and thunderstorms in the afternoon reducing the event to 18 holes from the planned 36-hole competition. The overall competition over a challenging Moor Park course also incorporates an under 16 category. Essex boys featured prominently in the results, with Michael Gilbert (Chelmsford) taking 2nd place in the overall championship and Harry Moncur (Abridge) finishing 4th. In the under 16’s event, Rory Bennet (Hainault Forest) finished in a creditable joint 3rd place. Canons Brook Golf Club hosted The Faldo Wedge this year with a maximum entry of 144 Juniors from all around the County. The weather forecast threatened storms so Klaxons were at the ready, however, the morning players set out on time on a very well presented course which proved to be a good test of golf for all players. The Faldo Wedge consists of morning and afternoon start times. Teams consists of three juniors representing their Club, with all three scores to count from 18 holes of stableford format. The mornings play saw some great golf, with Chigwell Golf Club taking the lunch time lead with a team total of 109 points consisting of Harry Ioannou (38pts), Thomas Atkinson (37pts) & Maura Burns-Zaragoza (34pts). Next best were Playgolf Colchester & Bentley on 106 points and Langdon Hills a further point back on 105. Millie May-Penfold’s 41 points was enough to pip Ciara Rushmer (Langdon Hills) on countback for the best individual girl’s score. Congratulations to both girls on excellent performances, a well-deserved handicap reduction will be in store. The day, however, belonged to Thorpe Hall A, consisting of last years winners, Ali-Abbas Haji, Luke King & Max Webb. The team managed to achieve a four point victory with 115 points. The big score coming from Ali-Abbas with 46 points, which was best individual boys score on the day. Luke managed 35 points and Max followed it up with 34. Not only have Thorpe Hall successfully defended the title they won last year, but they did it with the same team. Congratulations to all three boys. Thorpe Hall will now be representing Essex in the National Junior Club Championship later in the year, we wish the team all the very best of luck for the event in August. Fortunately the day was not interrupted as we managed to avoid all the storms crossing the south east region from the near continent. Our thanks to all the Junior Organisers that do so much for junior golf in the county and to Canons Brook Golf Club for hosting the event and making everyone so welcome. with the Winners prize at Frinton Golf Club.